Prime Minister Justin Trudeau delivers brief remarks at the opening session of the 10th ministerial meeting of the Lima Group, in Ottawa, on Feb. 4, 2019. Canada and 10 Latin American countries are urging the Venezuelan military to back Juan Guaido, the opposition leader who swore himself in as interim president of Venezuela in January, instead of socialist President Nicolas Maduro. The Lima Group, of which Canada is a member, made the call for action in a joint statement after a meeting in Ottawa on Monday. The alliance is looking for a peaceful resolution to the economic, political and humanitarian crises in Venezuela. The declaration comes as division among the international community over Venezuela deepens, with more than a dozen European countries joining the United States and the Lima Group, including Canada, in recognizing Mr. Guaido as the interim leader. Some South American countries are meeting separately with representatives from the European Union to discuss the Venezuelan crisis Thursday. Uruguay, which will play host at the meeting, has remained neutral on the situation, while Bolivia still supports Mr. Maduro. Russia, China, Turkey and Iran also continue to back Mr. Maduro, whose regime has been accused of committing crimes against humanity. Speaking to reporters Monday, Foreign Affairs Minister Chrystia Freeland detailed the position of Canada and other Lima Group members – Argentina, Brazil, Chile, Colombia, Costa Rica, Guatemala, Honduras, Panama, Paraguay and Peru – who signed a joint communiqué on Venezuela in Ottawa. “We are indeed calling on the military of Venezuela, as we call on all Venezuelans, as we call on all governments of the world, to recognize Juan Guaido as interim president of Venezuela,” Ms. Freeland said after the Lima Group meeting. Ms. Freeland was unequivocal in reiterating the Lima Group’s support for a peaceful transition to democracy in Venezuela and opposing a military intervention, which has been floated as an option by U.S. President Donald Trump. “Canada is absolutely not considering a military intervention,” Ms. Freeland said. Mr. Guaido, a virtually unknown politician until he was elected leader of the National Assembly at the beginning of January, unified Venezuela’s beleaguered opposition when he declared himself interim president on Jan. 23. He told Venezuelans the move was constitutional because the presidency was “vacated” after Mr. Maduro was re-elected last May in a vote from which all key opposition leaders were barred. The Venezuelan military is a key group that could determine who wins the showdown between Mr. Guaido and Mr. Maduro. In the days immediately after Mr. Guaido declared himself interim president, the country’s military continued to back Mr. Maduro. But that allegiance is now cracking. On the weekend, the country’s air force commander, General Francisco Esteban Yanez, publicly backed Mr. Guaido, saying he no longer recognizes Mr. Maduro as president. Speaking to reporters at the Lima Group meeting, Julio Borges, leader of one of Venezuela’s opposition parties, Justice First, said the international community has to focus its pressure on senior Venezuelan military officials. He alleged the younger ranks of the Venezuelan military support Mr. Guaido, but have been silenced by interrogation and torture. “I would like to be very clear – 99 per cent of officials within the army force are against Maduro," said Mr. Borges, former leader of the Venezuelan National Assembly. Mr. Guaido addressed the Lima Group Monday via video conference, expressing his gratitude to ministers for supporting his interim leadership. He also called for free and fair elections in order to “reorient” Venezuela toward democracy. “Unfortunately we are still under a dictatorship at the moment. That is why it is time to increase pressure. The mechanisms should be focused on putting an end to the usurpation, a real political end to the crisis in Venezuela,” Mr. Guaido said during his video address. He accused Mr. Maduro’s government Monday of trying to move up to US$1.2-billion from a state development bank to a financial entity in Uruguay, but did not present evidence. Mr. Guaido urged Uruguay to prevent the move. Mr. Maduro has blamed Washington and other Western countries for sabotaging Venezuela’s economy, including through sanctions. Ottawa has imposed sanctions of its own against 70 Maduro regime officials, freezing any Canadian assets they may have and banning them from travelling to Canada. In a 17-point joint communiqué Monday, the Lima Group agreed to include Mr. Guaido’s interim government in the alliance and recognize the diplomatic representatives he appoints to their respective countries. Prime Minister Justin Trudeau formally recognized Mr. Guaido’s representative to Canada, Orlando Viera-Blanco, during a speech to the Lima Group meeting Monday. However, the Venezuelan embassy in Ottawa remains under the control of the Maduro regime, so Mr. Viera-Blanco does not have any official diplomatic credentials in Canada. Mr. Trudeau also announced $53-million in new Canadian funding to support the needs of Venezuelans, including the three million refugees who fled the humanitarian crisis. 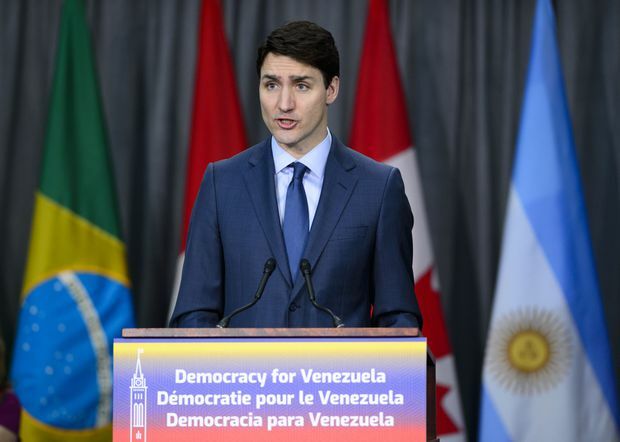 “We know that the people of Venezuela are facing tremendous hardship and they need our help, as do the countries who have taken in those fleeing violence,” Mr. Trudeau said. The funding, to be funnelled through trusted organizations on the ground in Venezuela, will provide emergency food assistance, health care, water, sanitation, education and protection services, with a focus on the needs of women and girls. It will also help monitor and report on the human-rights situation in Venezuela. Since 2017, Canada has provided $2.21-million in humanitarian assistance to help the most vulnerable people affected by the Venezuelan crisis. Monday’s announcement brings that total to more than $55-million. The Lima Group communiqué urged the Venezuelan military not to impede the entry of humanitarian assistance to Venezuelans. The Maduro government has blocked foreign aid in the past. Monday’s declaration was endorsed by 11 of the 14 Lima Group members. Mexico, which has remained neutral on the situation in Venezuela, did not sign on. Guyana and Saint Lucia, which have refrained from signing past communiques, didn’t sign the document either. A senior Canadian government official, who was not authorized to speak publicly on the matter, said Russian media outlets Sputnik, Ria Novosti and TASS as well as Venezuelan state-owned television station, teleSUR, were denied access to the Lima Group meeting Monday because of concerns they would spread misinformation about the event. In a statement, the Russian embassy in Ottawa called the decision to block the news outlets “highly reprehensible and shameful.” TASS is an accredited member of the Parliamentary Press Gallery. “Canada should stop restricting journalists from reporting freely without obstruction or reprisal and must apply to itself the same rules and standards it demands from others to follow,” the statement said.